Abstract: Historical research cannot be conceived without a close relation to physical text: paper is still the main source. However the emergence and subsequent multiplication of digital technologies within the historical field have tended to modify the examination of sources. This change is particularly apparent for text editions: how is one to manage the transfer from the manuscript age to a digital one? Can sources be understood and analysed without physical support? This paper will be based on experiences of using electronic editions of early modern texts, specifically diplomatic correspondences such as L’ambassade extraordinaire du duc d’Angoulême, comte de Béthune et abbé de Préaux vers les princes et potentats de l’Empire. TEI, a XML-based language, has been chosen for those editions. Using such a structured language – a far cry from the plain text created by classical text editors – implies changing the conception of what an edition is. We need not just think about texts anymore but only about the historical information contained within the text and which has to be highlighted in terms of the research. This requires researchers to think more about what they want and what they want to show in their studies. Above all, it allows researchers to track specific features such as diplomatic formulas and then to facilitate their analysis. The aim of this talk is to ask if and how digital technologies have changed how historians view sources and even if they have changed the historical studies themselves; how TEI can be used to create new kind of editions. This paper will try to show how, if well used, TEI and digital technologies highlight and add to the results of historical studies. Biography: Camille Desenclos is currently completing her PhD at the École nationale des Chartes where she is also engaged in leading several projects to create electronic editions of medieval and early modern texts including an edition of the correspondance of Antoine du Bourg. Her PhD is entitled ‘The Communication Policy of France in the Holy Roman Empire at the beginning of the Thirty Years War (1617-1624)’. A fundamental part of her PhD research includes creating electronic editions and the encoding and ciphering of diplomatic correspondence and structures in related medieval charters. Camille has given numerous conference papers largely concentrating on the Text Encoding Initiative and its application to her research. She was also a Visiting Researcher at the Department of Digital Humanities (DDH) at King’s last year. An electronic edition of the ‘Ambassade extraordinaire des duc d’Angoulême, comte de Béthune et abbé de Préaux’ which she has written will be available online shortly. To listen or watch this podcast go here. The IHR Seminar in Digital History would like to welcome you to its first seminar of the academic year. Historical research cannot be conceived without a close relation to physical text: paper is still the main source. However the emergence and subsequent multiplication of digital technologies within the historical field have tended to modify the examination of sources. This change is particularly apparent for text editions: how is one to manage the transfer from the manuscript age to a digital one? Can sources be understood and analysed without physical support? Camille Desenclos is currently completing her PhD at the École nationale des Chartes where she is also engaged in leading several projects to create electronic editions of medieval and early modern texts including an edition of the correspondance of Antoine du Bourg. Her PhD is entitled ‘The Communication Policy of France in the Holy Roman Empire at the beginning of the Thirty Years War (1617-1624)’. A fundamental part of her PhD research includes creating electronic editions and the encoding and ciphering of diplomatic correspondence and structures in related medieval charters. Camille has given numerous conference papers largely concentrating on the Text Encoding Initiative and its application to her research. She was also a Visiting Researcher at the Department of Digital Humanities (DDH) at King’s last year. An electronic edition of the ‘Ambassade extraordinaire des duc d’Angoulême, comte de Béthune et abbé de Préaux’ which she has written will be available online shortly. Seminars are streamed live online at HistorySpot. To keep in touch, follow us on Twitter (@IHRDigHist) or at the hashtag #dhist. Please join us for the next Digital History seminar either in person at Senate House or online via our video live stream. As per usual we will be offering you the chance to post questions for the speaker to answer, and will have a lively Twitter feed (under the #dhist hashtag). Example from one of the upcoming semantic data module pages. Discussion of the Histore Project – its aims and outputs. Jonathan talks about the various digital tools that we are looking at and discusses the tools audit and case stduies. Matt Phillpott discusses the semantic data and text mining modules. 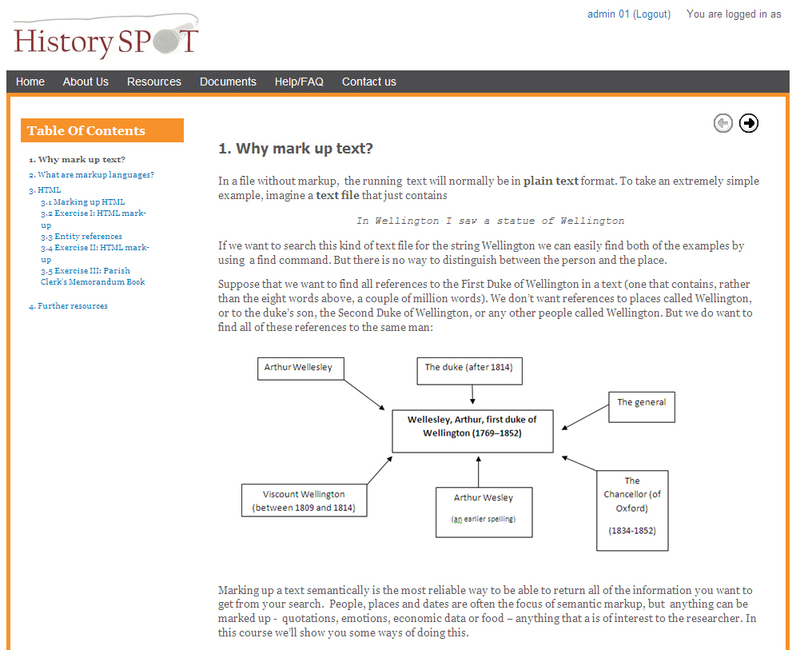 Matteo describes the process of text mining and how it might be useful for historians. Pip talks about the Text Creation Partnership for Early English Books Online (EEBO). This is part of the Text Encoding Initiative (TEI), which makes machine readable copies of old texts for greater searchability and analysis. Pip’s talk touches upon the issues of semantic data and text mining. Also check out the Histore Blog.